Unreserved Absolute Online Only Coin, Bullion, Currency, Gold & Silver Auction - Buy, Sell, Invest & Collect Coins, Currency & Bullion - Every item must sell, regardless of price. All lots open at $2 and Sell To High Bidder. Register & bid now on 320 lots: US Silver & Gold Coins, World Coins, Key Date Coins, Better Date Coins, Certified & Graded Coins, Currency, Paper Money, Banknotes, 40% Kennedy Halves, 90% Barber Half Dollars, Walking Half Dollars, Seated U.S. Coins, U.S. Type Coins, Franklin Half Dollars, Kennedy Halves, Capped Bust Halves, Mercury Dimes, Barber Dimes, Roosevelt Dimes, Morgan Silver Dollars, Peace Silver Dollars, U.S. Silver Mint Sets, U.S. Silver Proof Sets & Proof Coins, U.S. Silver Eagles, .999 Fine Silver Bullion Rounds & Bars, .999 Fine Gold Bullion, U.S. Gold Coins, U.S. Gold Indian Head Coins, U.S. Gold Liberty Head Coins, U.S. Fine Gold American Eagles, Error Coins, U.S. Flying Eagle Cents, U.S. Indian Head Pennies, U.S. Wheat Cents, U.S. V Nickels, U.S. Buffalo Nickels, War Nickels, Uncirculated Coins, Foreign Coins, Foreign Currency, Ancient Coins, Coin Collections, Fractional Currency, Confederate Currency, Silver Certificates, National Currency, Large Notes, Gold Certificates. Register & Bid Now in this comprehensive Absolute Online Coin, Bullion, Currency, U.S. & Foreign, Gold & Silver Online Auction. Lots are consigned by estates, trusts, dealers, individuals & private collections throughout the United States. Absolute Online Only Auction. Pre-bidding is Open Now - Register & Start Bidding. 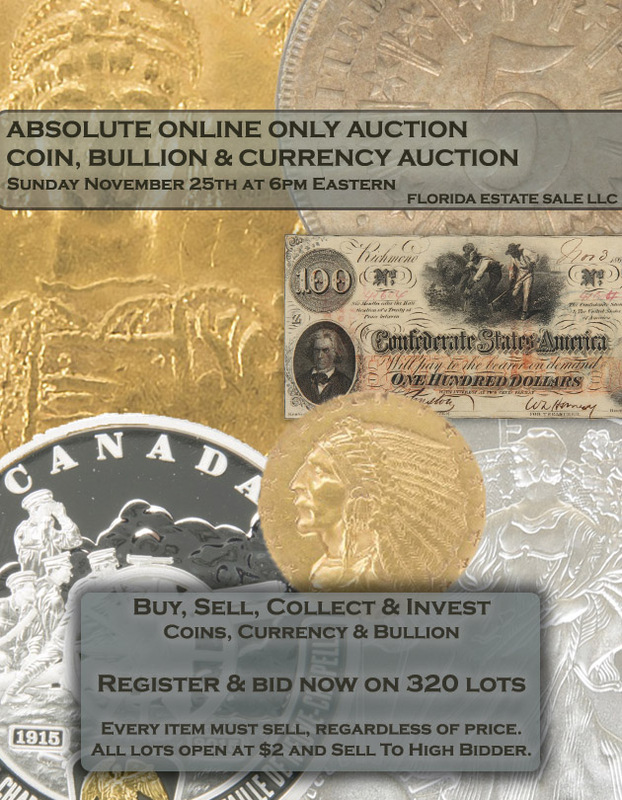 Live Auction Webcast (Live Real-Time Online Bidding) Begins at 6pm Eastern on Thursday November 25th 2018.